As much as I like giving users choice and control, bombarding people with too many options makes using software painful. This is why it is important to consider both defaults and flexibility of all the privacy-impacting features we roll out -- the airbags and seat belts of the software industry. Not everyone who cares about privacy know how to configure Firefox (or any software) to precisely suit their needs. 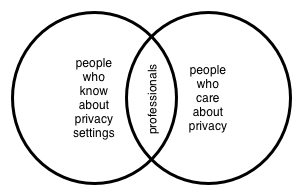 Those who are both care about their privacy and know how to configure software to precisely what they want are not the same; those with both qualities are often Privacy Professionals, or they work in a related field. A couple of weeks ago, I was inspired by some stuff Dr. John Guelke said to segment my thinking on privacy into two efforts: the privacy feature seat belts and airbags. He approaches privacy as something driven by social norms, whereas until recently, I mostly thought about it as a subjective choice about what I want with my identity and data. In fact, both of these perspectives are important, and they must work together to create the most positive effect for the Web. There are distinctly different reasons to provide certain safe defaults than there are to provide features users ultimate control: the airbags can help protect everyone†, and the seat belts†† will protect those who know to use them. Choice and Control (Seat Belts). It's crucial that people have all they need to maintain complete control over their experiences online, or the web becomes controlled solely by the businesses on it and not the people who live in it. Increasingly, people are performing more of their everyday activities online and deserve to be as much a part of their activities as they would in the real world and this is why I care so much about giving people who want it control over each bit of how they see and interact with the web. This is the reason Do Not Track was built into Firefox, and this is why software allows people change how the browser handles cookies. These features empower users to control their experiences online. Users enable and deploy these features on their own. Firefox doesn't turn on Do Not Track by default, because it's a seat belt. People choose if they want it or not. There are expectations about what people understand that are consistently held by a society or group. These social norms dictate expected behavior and, though not something that limit behavior, can be seen as social defaults. These norms change and fluctuate with the society, but you could say they are precisely what any member of the society expect to happen. The Web is a society of sorts, and people carry over their social norms from physical interactions with people to those interactions with web sites and corporate entities online. Here is where the social norms very importantly dictate the defaults of how a web browser should work (and frankly, how web sites should work too). People expect a site to remember small bits of information about their interactions, such as what is in their shopping cart, and this is why cookies are enabled by default, like an airbag. People do not expect to disclose their precise location to web sites, and that is why Geolocation is not activated by default. There are two driving forces here that dictate the best paths forward for inventing and building privacy features into the web: social norms, and individual choice. It's easier to listen to the cry or predict a need for individual choice; we can create any feature as if it were a seat belt -- features that users may or may not want to enable. The harder direction is understanding and following social norms, or what people expect without request or action. These are hard because they differ not only with time, but also across different groups of people. Technologists like me can more easily understand our subculture's values and build those into our software. We have to be careful, though, since society as a whole may not have the same values as our smaller group of software developers. We as an industry need to focus on what benefits all as a sensible default, and that may be completely opposite of what we computer geeks think. We need a better understanding of social norms and how they relate to people's data online. That understanding can help map norms to the defaults we build into all the web-oriented software we make. Everything else then should then be an optional feature, like a seat belt. † = Okay, so the analogy breaks down since airbags aren't good for you unless your seat belt is engaged, but the gist is that you don't have to think about the airbags. †† = And sure, "everyone" knows about seat belts, but pretend for this argument that they don't and the feature is more like those glass-breaking hammers that you can buy to free you from a submerged car; you can buy and use them, but they don't usually come with your car. @Sid (another one?! ): You pose some good questions, and I think this is still an open area. It's important to separate "choice and control" from what the defaults are, since relatively few people exercise control -- especially when the defaults reflect the local norms. I think the short answer to your questions is that we should address defaults on a case-by-case basis. If a default setting causes a culture to be up in arms, we should shy away from picking that as a global default. Sid - I enjoyed reading your article. I, for one, am interested in protecting my privacy when doing business on the internet. I only go on facebook to check on other people's status - I never post anything personal on facebook. Be assured that there are many people like me, who use the internet as a tool, but not as a social interface. Thanks for all you do to protect my privacy...I count on Firefox watching out for my interests.